Lourlo’s Illaoi was a huge reason why the Guardians put an end to their winless streak. The Golden Guardians are no longer winless in the North American League of Legends Championship Series. One of the newest teams to join the NA LCS picked up their first win in the league with a victory over 100 Thieves earlier today. In typical fashion for a team led by veteran mid laner Hai Lam, the Golden Guardians built an interesting team composition, drafting Illaoi top and Camille jungle. And both of these picks worked out extremely well for the Guardians. Former Team Liquid top laner Samson “Lourlo” Jackson was just a bully in the top lane, and Juan “Contractz” Garcia got right in his opponents’ faces with Camille. This aggression paid dividends for the Guardians as they got an early first blood on 100 Thieves ADC Cody Sun. The Guardians kept up the pressure as they slowly started to build their gold lead after the 16-minute mark. They quickly secured the first Baron of the game right after it spawned and used the buff to dismantle 100 Thieves’ turrets. The Golden Guardians continued this methodical approach as they took objectives and set up vision control to prevent 100 Thieves from gaining any gold. Eventually, super minions began to flood into 100 Thieves base. They desperately tried to prevent the Guardians from securing a third Baron, but their attempt was futile. After securing the Baron, Lourlo quickly teleported into 100 Thieves’ base to attack the Nexus. 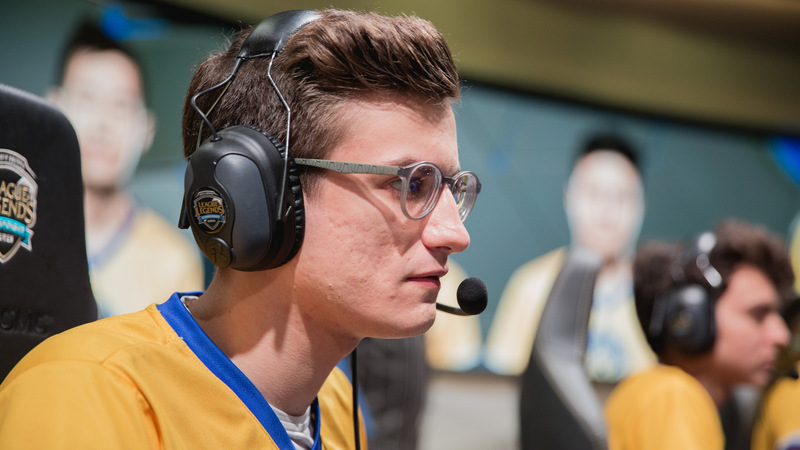 Although he lost his life in the process, Lourlo did enough damage to allow the rest of his team—and the Baron-empowered minions—to end the game and put a one in the win column for the Guardians. Contractz finished the game at 4/0/3, while Lourlo went 1/1/5. Hai produced a 2/2/8 scoreline as Orianna, and rookie ADC Matthew “Deftly” Chen went 3/2/4 as Kog’Maw. The Golden Guardians might still be in last place, but this could be the win that they needed to turn around their season. Hai and crew will look to make it two in a row when they take on OpTic Gaming at 9pm ET on Feb. 17.